US and French REACT participants at the French-American Workshop on June 21, 2018. 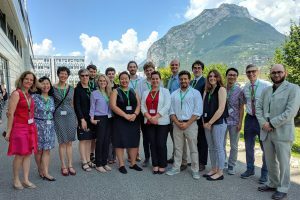 Part of the Penn REACT team gathered in Grenoble or joined via videoconference during the week of June 18 to participate in the annual REACT@GIANT meeting to discuss research progress and educational programming. REACT students participating in the 2018 GIANT International Internship Programme (GIIP) gave research updates to REACT faculty on site at GIANT and, as part of the French-American Workshop, where all GIIP students presented posters. Congratulations to Natalie Gogotsi, Katie Rose and Shawn Maguire for their posters being acknowledged by the event’s poster judges.